Cooling is essential to health, prosperity, and sustainability, underpinning many of the Sustainable Development Goals. Yet most cooling is energy intensive and highly polluting. 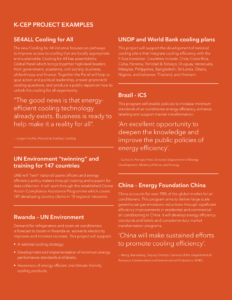 Demand for cooling is booming, so there is an urgent need to cut cooling related pollution. Without action, cooling could account for almost 20% of global greenhouse gas emissions by 2050. The 2016 Kigali Amendment to the Montreal Protocol could avoid up to 0.5°C of warming by phasing out F-gases used in cooling. 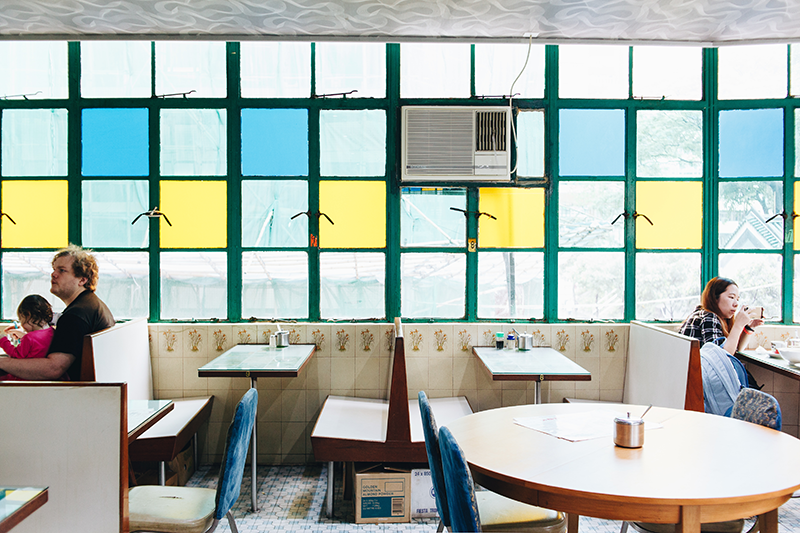 Promoting the energy efficiency of cooling technology during the switch to climate-friendly refrigerants could double these benefits according to the Lawrence Berkeley Laboratory. 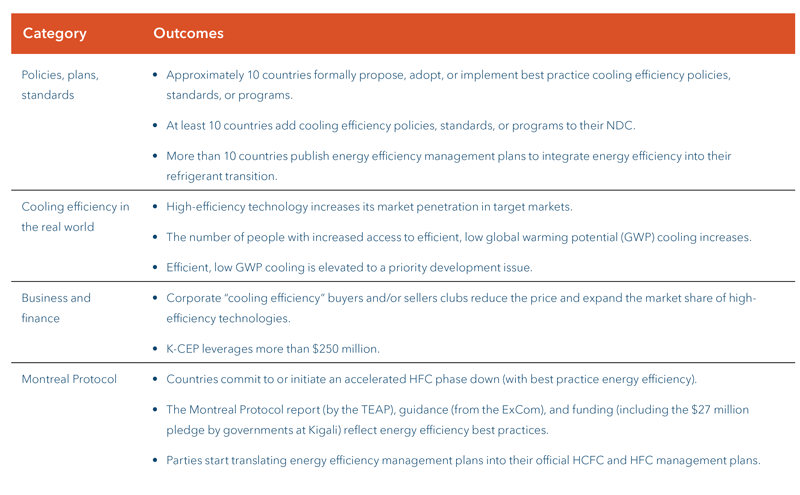 The Montreal Protocol Technology and Economic Assessment Panel (TEAP) Working Group Report on Energy Efficiency highlights how to deliver these sustainable development benefits from cooling. The Kigali Cooling Efficiency Program (K-CEP) envisages a world in which environmentally friendly, energy efficient cooling is accessible to all. K-CEP is designed to support countries, companies and communities in relation to the Kigali Amendment. K-CEP is deploying $52 million of philanthropic funds to strengthen institutions, support policy, enable technology, leverage finance and help make cooling accessible for all. 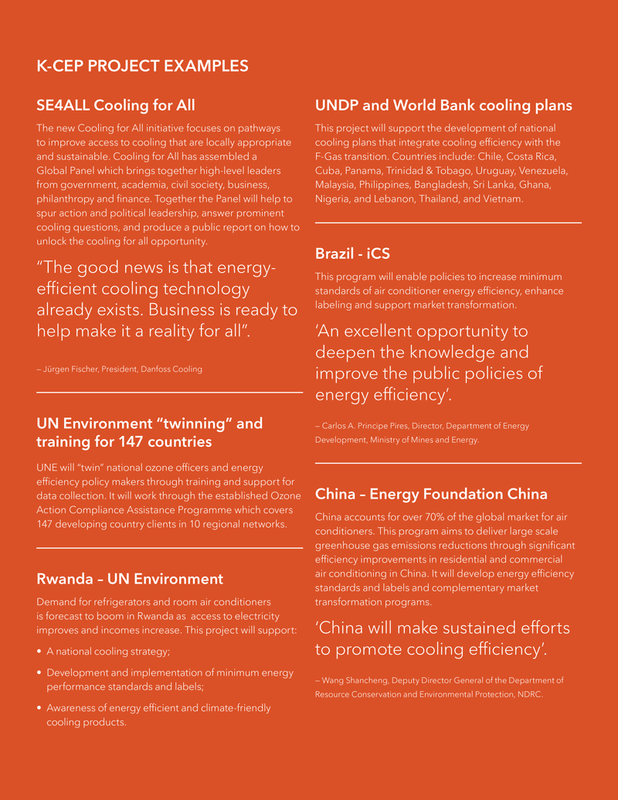 Countries, companies and K-CEP partners have already identified opportunities to progress cooling efficiency across the world. This important yet modest contribution towards realizing the huge benefits of cooling efficiency is shown conceptually in Figure 1. Additional opportunities for cooling financing and access to cooling for all are being developed. K-CEP will share insights and lessons learnt to maximize program benefits as widely as possible. All carbon savings numbers in Figure 1 relate to potential cumulative savings from now to 2050. They represent an initial, indicative view of savings potential and will be refined through further K-CEP funded work to improve consistency, attribution, and robustness. 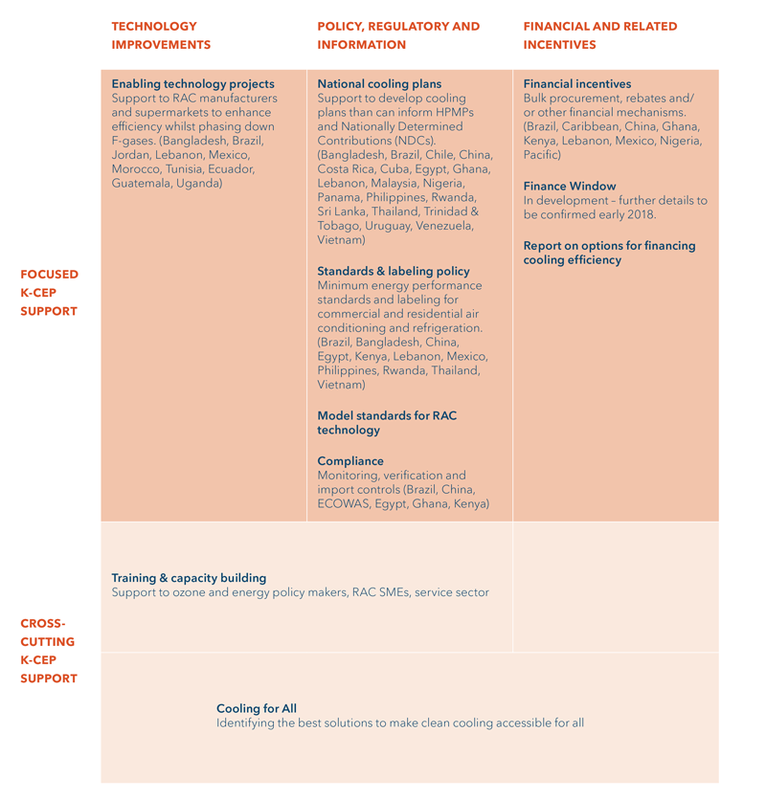 The Montreal Protocol TEAP report identified three main opportunities for improving the efficiency of refrigeration and air conditioning (RAC) equipment: technology; financial; and policy, regulatory and information. We have mapped these opportunities with early projects K-CEP is supporting in response to requests from countries and companies. K-CEP sits at the cross-roads of the Montreal Protocol, the United Nations Framework Convention on Climate Change, and the Sustainable Development Goals. K-CEP focuses its support to developing countries on the energy efficiency of cooling to increase and accelerate the climate and development benefits of the Kigali Amendment to phase down hydrofluorocarbons. K-CEP focuses primarily on air-conditioning and refrigeration, however other cooling solutions such as building design, shading, cool roofs, and super-efficient fans are considered in our work on access to cooling. K-CEP works in partnership with UN agencies (UN Environment, UNDP, UNIDO), the World Bank, the International Energy Agency, SE4All, and a growing coalition of NGOs, businesses, academia and civil society organizations around the world.